Whew! We made it through another holiday (an assumption since you are reading this)! I don’t know about you but I am pooped! Anyone else feel like your prep for weeks in advance for about 2 hour meal? Well let’s make all that hard work pay off for you, and have your Thanksgiving leftovers do double duty making your life easier. This Thanksgiving Stuffing Breakfast Strata is the perfect after Thanksgiving meal! 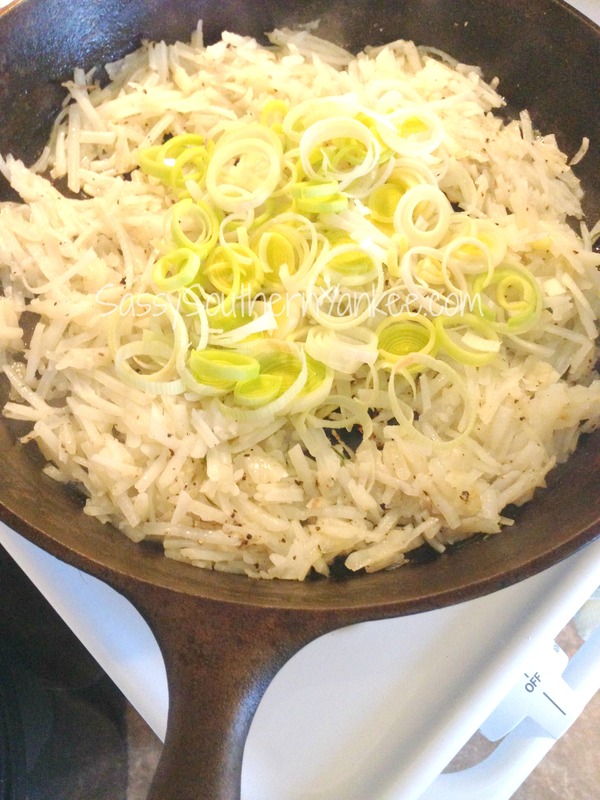 In a large skillet melt the butter with the hash-browns. Cook until they are just starting to brown. If desired add the slicked leeks just before removing from the heat. Remove the hash-browns from the heat and add the stuffing. If the stuffing has clumped together just break it up a bit with a spatula, so that the hash-browns and stuffing are evenly mixed. Place the skillet in the oven for about 7 min just until the stuffing and hash-browns are warmed then crack the eggs over the stuffing/ hash-brown mixture. 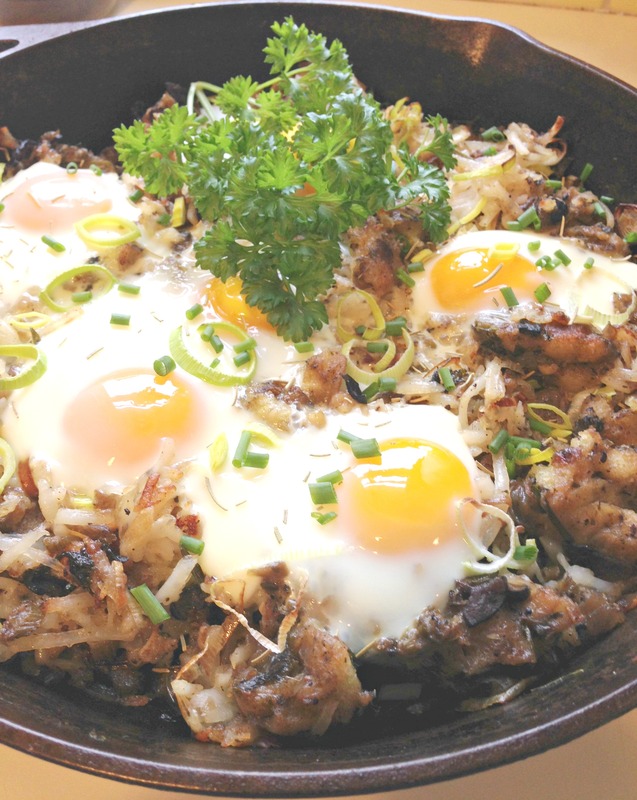 Place the skillet back into the oven and bake for an additional 10-12 min until the eggs are to your desired doneness. I like to sprinkle some fresh chives on top of the Thanksgiving stuffing breakfast strata to liven it up a bit a! Serve immediately with a nice cup of coffee and enjoy! Thanksgiving leftovers do double duty, and making your life easier. This Thanksgiving Stuffing Breakfast Strata is the perfect after Thanksgiving meal! Remove the hash-browns from the heat and add the stuffing. If the stuffing has clumped together just break it up a bit with a spatula, so that the hash-browns and stuffing are evenly mixed. Place the skillet in the oven for about 7 min just until the stuffing and hash-browns are warmed then crack the eggs over the stuffing/ hash-brown mixture. 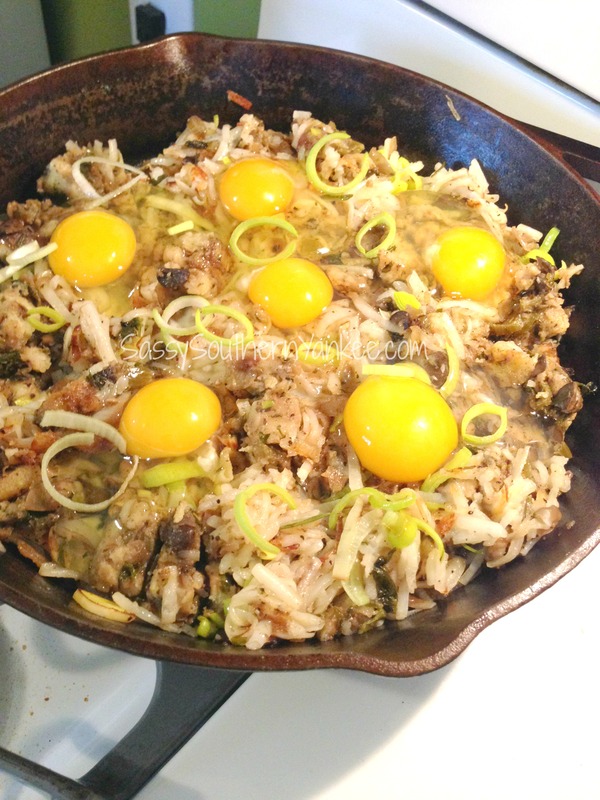 Place the skillet back into the oven and bake for an additional 10-12 min until the eggs are to your desired doneness. 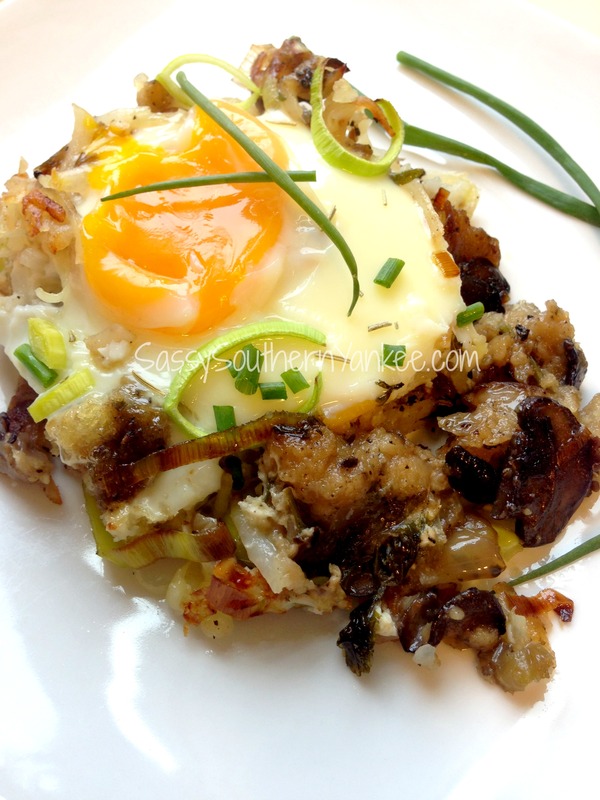 This entry was posted in Breakfast and tagged Breakfast bake, Brunch, Caramelized Onions, Cast Iron Skillet meals, Dressing, Eggs, Gluten Free, Hash-browns, Holiday Brunch, Leftovers, Mashed Potatoes, Portobello Mushrooms, Quick Breakfast Bakes, Strata, Stuffing, Thanksgiving leftovers.